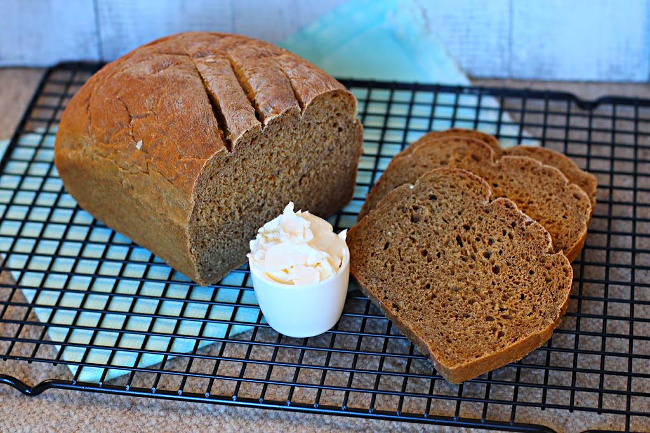 This Molasses Oatmeal Bread is as healthy as it is delicious. With just one tablespoon of added fat, lots of oatmeal and Vitamin B rich molasses, this bread is soft, fluffy and a favorite when I make it for friends and family. Have you ever considered turning the Winter months into a food goal project? I suppose you could call it a New Year’s Resolution. Pick something that you’d like to master. Strengthen your kitchen skills. Whether it be cookies, lasagna, Thai food or…or how about bread? January and February would be a perfect time to learn on a new culinary skill. Declare war on your nemesis food. Decide on your task…make it once a week until you master the dish. Me? I’m working on bread. One of the unexpected benefits that resulted from my time in Culinary School was learning that I actually loved making bread. I used to think of it as something tedious and too hard to learn. And I truly believe that if people knew how easy it is to make fresh bread, more would take the time to do it. I’ve been making bread as much as I can. I’ve become familiar with how the dough should feel and behave during each step of the the process. And watching the dough come to life as it rises is truly rewarding. And the aroma as it bakes is simply intoxicating. Not to mention the flavor and texture of fresh baked bread. It makes a mockery of the mass produced bread we buy on our supermarket bread aisle. At this point in my bread making career, I’m in the process of acquiring a few great recipes that will round out my collection. Recipes that are beloved, reliable and reliable to make. I’ve not found that perfect bread cookbook yet, so have been relying on recipes I’ve found tucked inside my collection of cookbooks. I found this Molasses Oatmeal bread recipe hiding inside one of my favorite bed and breakfast cookbooks, Dairy Hollow House. This cookbook contains some of the best soup recipes you will ever slurp, and where there’ s good soup, there’s good bread. 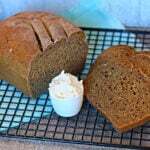 I’ve made this molasses bread recipe many times and it’s become on of our favorites. It’s a wonderful dark, crusty fragrant bread. Dairy Hollow House sites the recipe as being from the famous bed and breakfast, Rabbit Hill Inn, in Lower Waterford, Vermont. The role molasses plays is important here, making the bread almost as dark as pumpernickel and with a flavor all its own. Molasses is a key flavoring in many New England breads, such as Boston Brown Bread. The thick brown syrup is a little intense on its own, but in breads like these, it is delicious. A sweetening far more dimensional than plain old sugar or even honey. Sweetness with pleasantly subtle sour bitter under note of flavor. It’s great for a breakfast toast served with eggs. Wonderful with an apple butter or jelly. Nice for lunch with a slice of Swiss cheese melted over it. And as a base for egg salad sandwich. And possibly the best BLT you’ll eat in your entire life. The original recipe calls for Blackstrap molasses, which will give the bread a potent bittersweet flavor. I’ve used regular molasses and find I like the flavor better. I hope you give this molasses oatmeal bread recipe a try, and if you do, please come back and give the recipe a star rating. And leave a comment about your experience with the recipe. And if you have a favorite oatmeal bread recipe a try, please let me know, I’d love to give it a try. A wonderful dark crusty fragrant bread from the Rabbit Hill Inn in Vermont. In a Kitchen-aid Mixing bowl, pour the boiling water over the oatmeal and butter. Let stand 30 minutes. In a small bowl, sprinkle the yeast over the lukewarm water and let stand to dissolve. 5 - 10 minutes. Add the yeast, molasses and salt to the oatmeal mixture and stir well. Using your Kitchen-aid paddle attachment, on low, stir in enough of the flour to make a kneadable dough 1 cup at a time, so that is still somewhat sticky to the touch. Switching to the dough hook, knead until smooth and elastic on power 4. About 7 minutes. Keep adding pinches of flour until the bread just starts to clean the side of the bowl. For me, I usually end up adding about 6 - 8 pinches. The dough will still be sticky. Transfer dough to a large oiled bowl. Turn dough to coat and cover with a clean cloth and let rise until doubled. About 1 1/2 hours. Oil two 9 x 5 inch loaf pans. Punch the dough down and divide it in half. Shape the dough into loaves and place them in the prepared pans. Cover and let rise until doubled in bulk. About 40 minutes. About 30 minuites into the final rise, preheat over to 375 degrees. Bake the bread until crusty, about 30 minutes. Turn the loaves out of the pans onto a wire rack. Let cook. The original recipe calls for Blackstrap molasses, which will give the bread a potent bittersweet flavor. I've used regular molasses and find I like the flavor better. Lea Ann, that’s a beautiful loaf! I love making bread – it’s my “thing,” you might say. Been making it since I was very young. I love kneading dough so only use my stand mixer when I’ve got other fish to fry! Even if I couldn’t, for some reason, eat it, I’d make it just for the smell! Definitely a great looking loaf and your making me hungry with all the suggestions—Swiss cheese? Yes, please! Happy new year and I hope your holidays were merry and bright! Happy New Year to You Debra. Always nice to see you stop in. I love making bread when it’s cold and boy has it been cold. Your oatmeal molasses bread looks like a great bread to bake next. Good timing. Plan to make more bread this weekend. I divided the recipes in half and made one loaf this weekend. Great recipe! A nice crumb and great flavor. I do use Blackstrap molasses, but then I do love Blackstrap. Loved the flavor that that much molasses added to the bread. We have used it for both chicken salad sandwiches and PB&J. Thanks for sharing this recipe Lea Ann! It’s been WAY too long since I’ve baked bread. A perfect project for this chilly Saturday! Yum! I just made this bread, Lea Ann, and it’s delicious. The molasses gives it a deep rich flavor and the texture is perfect. It will make great sandwiches and it’s wonderful toasted. I’m looking forward to making this bread often. Thanks for sharing a terrific recipe. Hi Cathy, first of all, it’s really great t hear from you. Thanks for leaving the comment. I’m so glad you liked the bread. It’s most certainly a favorite around here. I’m curious, did you use blackstrap molasses? or regular molasses? I must make this bread to bring back memories. We stayed at the Rabbit Hill Inn several times when the original owners John & Maureen Magee ran the inn, then again when their assistances bought it. The food at the Inn was always excellent. Hi Karen. I’ve been to their website – it looks lovely. And lucky you to stay there. I’m sure the food was top notch – it just looks like that kind of place. Made these for the first time today. What a great recipe! Thanks so much for sharing. Thanks so much for letting me know Jenn. We love this recipe and I make it more often than any other bread recipe I have.